Bear with me as I deviate from the format again and talk about something new I've discovered. I'm not going to pretend that I'm new to soap operas because that would just be a lie. I've never been a huge devotee but I can tell you that there have been 2 actors that played Bo Brady on Days of Our Lives and I have attended Lucy's Nurses Ball on General Hospital. 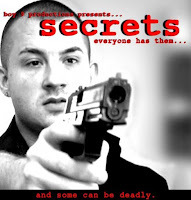 They never really held my interest for more than a whole season but a week or so ago, I found an online soap called secrets. Nothing has captivated my attention like this soap. It's an independently produced show created by Boy 9 Productions and revolves around the Sabitino family in Center City. The main cahracters are Donovan Kendall (screen writer, college professor), Marco Sabitino (Long lost prodigal son of the Sabitino clan) and Gina Sabitino (Scheming sister to Marco). The episodes are broken up into easily digestible 10 minute increments and are paced in such a way that once you start watching them you don't want to start. The writing is as good as any mainstream soap opera and make you want to keep watching. The acting can be exceptionally strong in areas and in some it is a bit weak but it's an independently producced show so when you step into the role of a viewer, you are fully aware that it's mostly likely not going to be Academy Award Winning drama but it is compelling. Damien Tracy as Donovan Kendall works exceptionally well and he delivers his lines with a equal amount of bile and disgust when he needs to and he is able to show the sincerity he needs to as well. Rob Paluso as Tyler is one of my favorite actor/character combinations. I think he does an extremely good job with the material. Robert J. Miller as Logan does not disappoint when on screen and has come into his own throughout the course of the show. In the beginning it felt like what he lacked in acting ability, he made up for with pectorals but by the time you get to know Logan, you see that Robert has some chops and isn't just a pretty face. Christopher Ackley portrays a convincing Private Investigator and can give as good as he gets when dealing with the conniving Gina Sabitino. If you are a fan of soaps, gay themed shows or independently produced programming, I highly recommend this show. The story is on par with any other soap and it continually reminds you how dangerous secrets are to keep. My only disappointment is that I am now caught up and will have to wait for new episodes to be released online.